Customer Service is very important to the Department of Public Works & Transportation (DPW&T) Our Certified Community Transit Managers (CCTM's) and rural community-based transit program accomplishes an essential mobility mission of the County, connecting people, communities, workplaces, educational institutions, recreational opportunities and many other essential destinations on a regular and continuous basis. Over 30,000 riders ride the St. Mary’s Transit System (STS) per month. Transit also plays a key role in the viability of the local economy and in the livability of our neighborhoods. In addition, STS provides complimentary ADA Paratransit services for persons with disabilities and a Specialized Statewide Transportation Assistance Program (SSTAP) for the elderly and persons with disabilities that are not sufficiently close to the main public transportation routes. 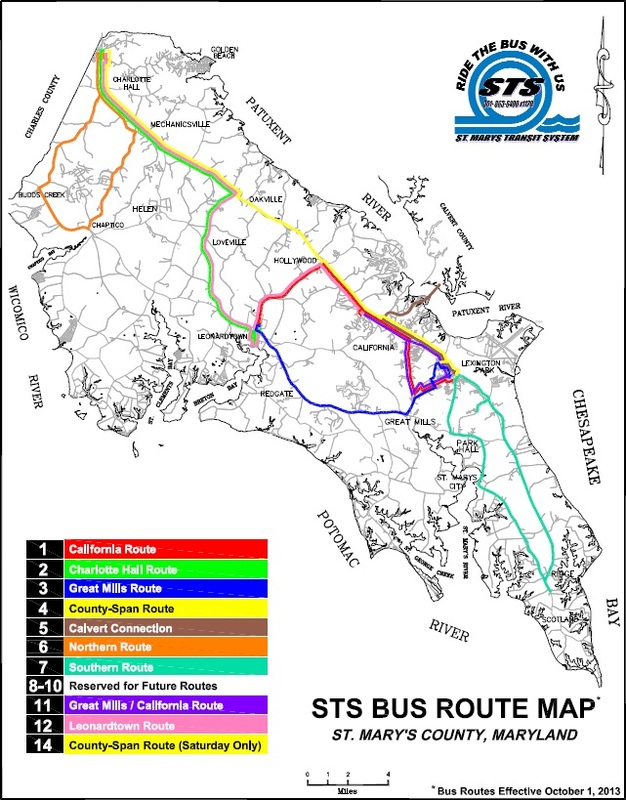 In June 2013 the Maryland Transit Administration (MTA) approved a 5-year Transportation Development Plan (TDP) to improve public transportation service in St. Mary's County and we are committed to ensuring that no person is excluded from participation or denied the benefits of the transit services we offer. If you feel you have been discriminated by the STS - Transportation Division please complete the Non Discriminatory Policy and submit the Form to Mary Ann Blankenship at maryann.blankenship@stmarysmd.com. View the entire STS Bus Schedule here. (Saturday) 7 a.m. to 7 p.m.
(Saturday) 6 a.m. to 11 p.m.
(Sunday) 6 a.m. to 9 p.m.
To pre-schedule "Pick-up" or "Stop Requests" please call (301) 475-4200 ext *1120 Monday - Saturday between 5:30 A.M. and 8:30 P.M. When our offices are closed, arrangements can be made by leaving your name, bus route and telephone number after the pre-recorded message. Otherwise, arrangements can be made with the individual drivers upon boarding the bus. Transferring from one route to another may occur at the following specified transfer locations; the Governmental Center Complex in Leonardtown, the Tulagi Place Park & Ride lot in Lexington Park, and the Charlotte Hall Square. A single transfer fee is used for an uninterrupted ride across all of the routes. Transfers will not be accepted for interrupted trips at locations other than these transfer points; riders will be required to pay a new fee. Bus Schedules for St. Mary's Transit System (STS) and VanGo are available from the bus drivers. Each county's bus tickets will be honored by the other county, therefore there will be no extra cost to our passengers. Be at a safe location (typically 50 feet before an intersection/street corner) along the route Be on the appropriate side of the street (i.e. northbound, southbound, etc.) Be clear in flagging the driver Determine the approximate vehicle arrival time at the flag location (based on times identified on the schedule for designated stops surrounding the flag location) and arrive early. If you are able, call STS ahead of time so the driver can be notified to be looking for you. This will decrease your chances of being missed or not seen by the driver. For the safety of our drivers and passengers, the bus drivers are not allowed to provide change. Therefore, all passengers must have exact fare or an STS ticket when boarding our STS buses. Each bus driver reserves the right to refuse transportation to any passenger /rider who does not pay the required fare or who does not honor the Bus Rider’s Agreement. If you lose an item on an STS bus, please call the STS office at (301) 475-4200 ext *1120 or *1121 between 8:00 am and 5:00 pm. Our staff will be happy to see if the item has been returned or found. Although STS is not responsible for lost items, all found items will be held at the STS office for a period of up to thirty (30) days. If we can verify that the item is the property of the passenger, the item will be returned. Our office is staffed Monday through Saturday, 5:30 A.M. to 8:30 P.M. We are here to assist you. Customers who are not familiar with our STS Services may call us for assistance at (301) 475-4200 ext *1120 or *1121. A dispatcher will tell you which bus or route you will need to reach your destination, advise you of any needed transfers, help you determine the time that the bus will arrive at your stop and help you determine your exact fare. To assure quick and easy service when you call, please provide your name, telephone number, location and destination or simply e-mail us.